1985 Strike Force Adams Family 1971 Episode: "MIA"
1992 魔界奇譚 Episode: "What's Cookin'?" 1998 衰仔樂園 自己 Episode: "Chef Aid"
2000 The Outer Limits Episode: "Gettysburg"
2009 豪斯医生 Eddie Episode: "Simple Explanation"
2009 Ghost Hunters 自己 Episode: "Bat Out of Hell"
2009 神探阿蒙 Hadley Jorgensen牧師 Episode: "Mr. Monk and the Voodoo Curse"
2010 吉列合唱團 Barry Jeffries Episode: "The Rocky Horror Glee Show"
2010 Ghost Hunters 自己 Episode: "Sloss Furnaces"
2012 律海佳人 Charlie DeKay Episode: "Kiss Me, Kate"
^ News And Notes. Jim Steinman. February 28, 2007 [July 6, 2009]. ^ Fink, Jerry. Tacos & Tequila/Chefs to the Max raise funds for injured critic. Las Vegas Tribune. 2014-03-06 [2014-05-10]. （原始内容存档于2014-05-12）. ^ Barnard, Sarah. 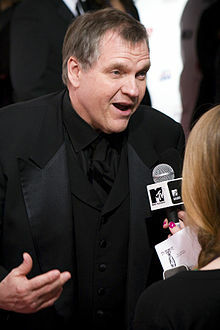 "The Biography Channel – Meat Loaf Biography". Archived from the original on February 12, 2009. Retrieved January 17, 2009. ^ Mitovich, Matt Webb. Exclusive: USA's Fairly Legal Serves Up a Savory Helping of Meat Loaf. TV Line. February 22, 2012 [May 7, 2012]. Meat Loaf. 《到地獄走了一回：自傳》. ReganBooks. 1999. ISBN 0-06-039293-2.